France is the final country of our Epic Expedition, and this is our final blog post based on country by country experiences. As the keyboard on Bob’s Surface no longer works, any computer work has become extreme tedious, hence there are no photos with this posting. Hopefully we will also have time and energy to reflect on the meaning of the full nine months we’ve been on the road, and will also commit those summary thoughts to this site. We spent three and half weeks in France, a few days longer than first planned, because we preferred to leave northern Italy ahead of forecast torrential rain (that subsequently drenched the region and caused major flooding). We also chose not to hug the north Italian coast and the southern French beaches, opting instead for the route through the many tunnels of the Italian and French Alps, including one tunnel of twelve km. These weeks have been less ‘adventurous’ – not lost as often, food has exceeded expectations, more English language is spoken (compensating for our abysmal abilities – limited to hello, please, thank you and goodbye). Also, the landscape has been more ‘civilised’ – less mountainous, better roads, dependable road signage … Autumn leaves have continued to amaze us throughout the country. At a semi-alpine city called Chambery, we met up with a pair of young backpackers whom we’d befriended last year when they were on their own epic Australian adventure. We enjoyed these face to face chats with them. They were only people we’d met in nine months of travel whom we had previously known. 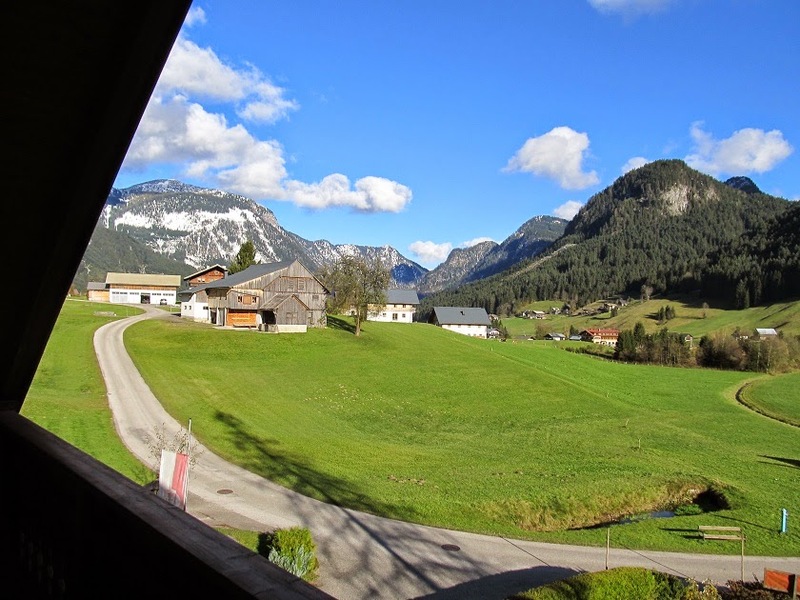 Continuing westwards, and traveling through attractive rural countryside, we stayed first in a small village for two nights and caught up on some pleasant hilly walking. From there, we went to yet another small rural medieval village, staying in a rented apartment for a full week. The apartment was quite a luxury for us – it was spacious, had cooking facilities, and was quiet. At this village (Lauzerte), we went on two country walks, ten km and twenty km and also visited the nearby city of Toulouse (where Airbuses are made). We were also keen to seen something of war history, so drove north to Normandy, on whose beaches Allied troops miraculously landed and liberated France and in turn the rest of Europe seventy years ago this last June. Frightfully cold, damp weather slowed us down, and besides, most of the businesses that cater for tourists have already closed down for winter. Nonetheless, we spent our available time quite productively, and WW2 history will be all the more meaningful to us as a result of seeing these places first hand. Returning the car (after 15,782 km) provided us with our final driving challenge. Now a GPS does not handle road-works and detours well, so in the busy centre of downtown Rennes, where road-works abound in the vicinity of Europcar/train station, we could still be circling our destination if Anne had not gone ahead on foot to investigate. Even then, it took several more three km loops before we met up again at a pre-arranged street corner and another three loops before we correctly identified the obscure alleyway into the car park. That’s the way we spent two hours of a Wednesday morning. Luckily we had no time constraints such as an imminent train departure. We felt blessed to have had five months of safe travel literally all over Europe. Two visits to a computer store followed: one to purchase a new keypad for Bob’s Surface tablet, and the other to return it upon realizing that it was not a qwerty keyboard. A three hundred km train ride then took us to Paris, and after a half hour ride in the underground, arrived at the suburb of Montmartre where our Airbnb host met us. Since then, life has been straightforward as we rediscover the city’s attractions – albeit in temperatures of ten, six and two degrees! In a week’s time, Brisbane temperatures will shock our systems in the opposite direction! We are spending our final days in Paris, staying in the second Airbnb apartment we rented. Two days before arriving we received an email from the original host saying it no longer suited for us to stay in his apartment. A hasty search lead us to this place, interestingly situated in an area where 90% of the population is African, which opens up quite a different face to the city. As we visited Paris three years ago it is not new to us, so this time we have been able to see new sights, some where the walking discovery tours take us and others of our own accord. An afternoon at the famous Paris flea markets was fascinating, where one can buy everything from the smallest to the largest, the exotic to the ordinary. Amongst all of this Anne was delighted to find a red leather cap to replace the one that was lost at the end of our last trip to Europe. We fly out from Paris on 5th of December and will spend three nights in Singapore before arriving back in Brisbane on the 9th. That will bring to a close what we now term our Epic Expedition. We are very aware of the many blessings that have accompanied us every day of our travels, particularly safety and health. If you are one of the people who have supported our travels with prayer, thank you. Thank you to all for taking the time to follow our journey. It’s been good to have written for an audience, as well as having the discipline of a blog giving us cause to reflect on the different stages of our journey. The significance of what we have achieved will enact itself in our lives in different ways over time. For now, here are some of our individual reflections. Respected travel writers often develop the theme that travel is not just for a holiday, but a time to extend one's boundaries and be challenged in what you see and do. That had certainly been the case for me for over the last nine months as I have achieved things we never thought possible and seen things I could not have imagined. 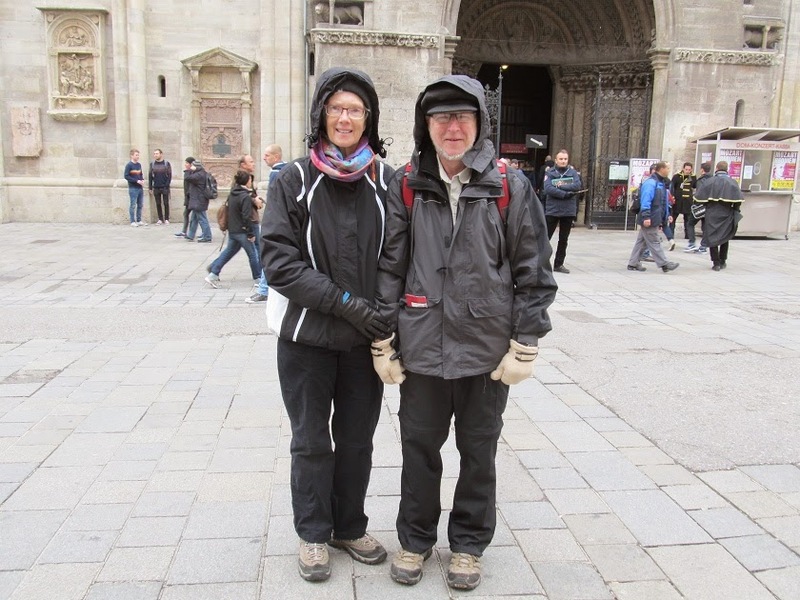 Our photos will show our walking paths in Spain, deserts in Morocco, peasant farming in Romania, snow in Austria. There are photos of grand buildings and simple huts; of individual faces along with crowds of thousands. We have seen so much yet know that if we did it again there would be more to see ... and even more after that. What an amazing world we live in. The learning has been constant, daily encountering sights that stimulated my understanding in history, geography, religion, war and peace, art, architecture, socio-economics, food, technology .... the list goes on. So often these things give cause for comparison with our life in Australia, thus giving a double outcome in the learning. I have been reminded that Australia is a very young country. We are not the centre of the world as our politicians may like to think and while we are a 'lucky' country in many ways we still have a lot of growing to happen. We have not travelled in the 'traditional' way of sixty-plus year olds. If you look back on photos you'll see us wearing the same limited clothes that we had at the start of the trip. No make-up for nine months, no perfumes or dressing up to go out, no English television or magazines. For most of the time our space has been limited to a bed in a hostel, a small room in a guest house or hotel and driving in our car. It's been a simple existence and that has also been an important part the learning for me. A particular blessing is that after nine months of constant togetherness our relationship has not faltered and the sharing of such rich experiences has given us a unique bond. Our trip has been made all the richer because of the hospitality hosts we have stayed with. After making contact with these people over twelve months ago it was good to meet them in person. Without exception we have been warmly welcomed into every home and have learnt so much through our conversations and many questions. Sincere thanks to you all and we look forward to continuing to host fellow travellers upon our return. Soon we will be home in familiar places with familiar faces and that too has its special attraction. I return richer in memories and experience to be shared and used in a way that benefits others. Nine months. The time it takes to make a baby. That’s how long we’ve roamed greater Europe during 2014, evolving and growing as citizens of the world. I’ve walked the road (the Camino de Santiago), recognising my own abilities and limitations, but also recognising and growing my strengths. We’ve learned to navigate and travel by car, bus, train and ferry in the various countries, driven safely on the wrong side of the road for five months. I treasure the days, weeks and months that I’ve had here, experiencing first-hand the marvels of nature, human endeavour, and cultures. These have been days of adventure, exhaustion, solitude and sharing with my life’s companion. Anne is both the motivation for and joy of sharing these nine months! As a result of our experiences, I’d like to think I’ve become less insular and more tolerant. And that people will become more tolerant of me and my culture. Were we successful in achieving our objectives? We’ve certainly had little opportunity to hanker after ‘the good old days’ of Anne’s 24/7 intense working life! In terms of specific plans for 2015 and beyond? Only to make a gentle resumption of Australian life, to spend supportive time with each of our children and their families, and to construct a positive period of early retirement years. Some thoughts to my family and friends: I’d like you too to be bold and adventurous in all ways. I’d like this Epic Expedition of ours to give you ‘permission’ and encouragement to also seize opportunities. God bless you all through your own life’s travels. Say the word “Italy” and the word associations that people commonly think of are pizza, pasta and Tuscany. After our sojourn in Italy our minds think of words like landscapes, architecture and friendly people (as well as the pizza and pasta). Italy has diverse landscapes and although we visited only a fraction of the country, we saw a variety of scenery as we drove from the snowy peaks from Austria down a long valley into central Italy and then through flat agricultural land in the region of Bologna. Entering Italy from the North takes one through the Italian Alps and then a gradual descent to flatter agricultural and industrial areas. As a result of ignoring the GPS instructions at Bologna, we finished up driving into Tuscany and the hill country of Umbria via a devious mountain route instead of by the main, direct highway. We had passed through some of these areas in our travels of three years ago, so it felt a little like coming ‘home’. After a few days in Umbria, we went to the region of rugged coastline known as Cinque Terre located at the top of the ‘leg’ of Italy – a precipitous hillside coastal strip that has been laboriously converted into 2,000 km of tight terraces (for olives and grapevines) using some 100 million stones (estimated – not counted). The site has UNESCO World Heritage site listing, and the effort needed for its construction can be compared to the building of the pyramids or the Great Wall of China. We timed our arrival in this area to coincide with warm sunny weather, which permitted us to walk along the Cinque Terra path. This path connects five coastal villages which cling to the rocky coast. It was a beautiful walk (or, we should say climb, for it involves going up and down many hundreds of steps) with views of the coastline and terraced hillsides, and pauses to look around the villages with their winding, narrow streets. Tuscany 's landscape is more undulating than that of Umbria. The town of Cortona had big attraction to Anne, who has read books by Frances Mayes (Under the Tuscan Sun, plus many others). Italy attracts many expatriates who live out their dreams by buying an old house, restoring it and living ‘off the land’ or using it as a holiday home or rooms for tourists. Just as diverse as the scenery is the architecture of the different regions. To walk in the hill towns of Umbria takes one back to medieval times. Each has its own old city wall, complete with towers, gates, churches, convoluted, multi-level pathways and streets, reachable to the tourist only by winding roads that go up and up. One walks back into a time when fortification from enemies was the over-riding consideration when building a city. In our time in Umbria we stayed with Giovanna, with whom we had contact last year. It was a delight to meet her and learn from her. Giovanna purchased a dwelling’in what was a ‘ghost village’. She has restored the remains of a roof and derelict walls into a most comfortable home consistent with heritage rules. Her village house is quite remote, reachable only by a very bad road, so bad that we did not take our car on it, but left it parked in the nearby town and either travelled to and fro with Giovanna or walked in and out. From Giovanna and her friends, to staff or other clients in restaurants and hotels, we encountered only friendliness and helpfulness. We enjoyed watching the animated conversations of the Italians, accompanied with much expression and many gestures. And yes, the pizza and pasta were excellent! (along with a delicious fish soup). We chose to leave northern Italy for France a couple days early because of forecast heavy rain. Just as well! Later news reported torrential rains, flash flooding and loss of life in the areas we'd driven through. Hearts warmed by Austria - despite the cold! By the time we got to Vienna, a weather system dubbed Tropical Rainstorm Gonzales, had brought heavy rain, snow and cold temperatures of eight to ten degrees to much of Europe. These events shocked our biological temperature control systems within a few hours of emerging from our hotel – notwithstanding five layers of thermal-ware, gloves, beanies etc. We went on a Hop-on Hop-off bus, guided walking tours, and our own random routes around town. Vienna is a grand city with majestic buildings around every corner, a legacy from the time of the Austrian empire and the reign of the Hapsburg’s. You know it’s a grand city when the size of the buildings means you can’t fit them all on one photo! Our noses ran, our eyes went red....even our teeth hurt when we breathed in the cold air! Around this corner, a palace....around the next, a gold trimmed statute. Even the teddy bears were waltzing! Ah yes, its all chocolate!!! We often use the Booking.com website to organize our accommodation – usually picking a place somewhat at random or on the basis of client reviews. 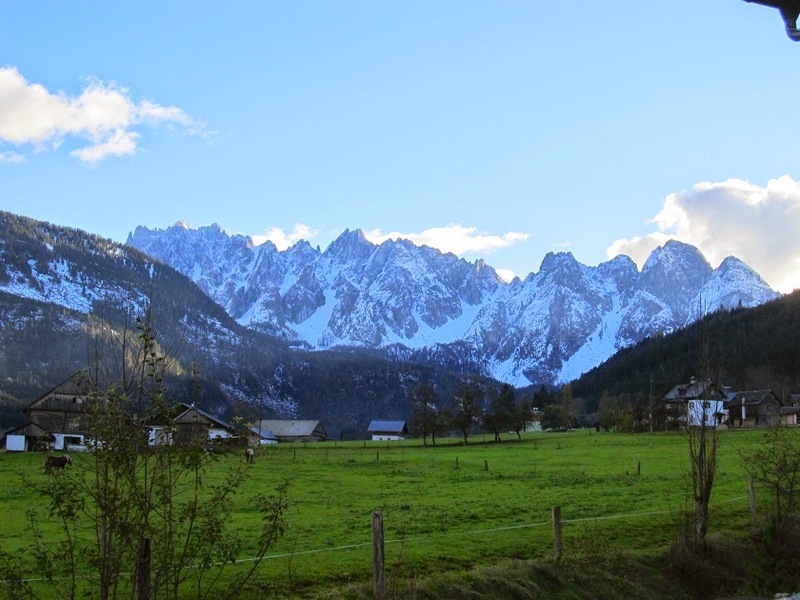 We were delighted to find that our searching took us to a village region called Gosau – which turned out to be even colder than Vienna. However, we were too enchanted by the scenery to pay attention to temperature trivia – the soaring, snow-clad, mountains – picture-perfect alpine villages – horses and cows grazing green fields – the chill, still lakes, clusters of residual snow-falls along the roadsides … We stayed for two nights in a warm apartment overlooking the valley, snowy peaks and frosty pastures, and spent one day on an extended lake-side walk. Our walk around Lake Gosau was a day of chill beauty. We also visited Hallstatt, a small village fitted precariously between a lake and the mountains that plunge to its edges. A fascinating (though macabre) consequence of ‘living on the edge’ is that, over the centuries, there was just not enough flat ground in which to bury the newly dead. The people managed this by exhuming previously interred bodies (after ten or twenty years), cleaning up the skeleton a bit, and placing it in an orderly stack with everyone else’s skulls and femurs in a ‘charnel house’. You may have come across this term in novels or history books. Hallstatt is also fascinating in other ways! What a peaceful place to be buried (above). It was the people below who had to move out to make room! Salzburg was a surprise for us and a city we really enjoyed. Music, music, music! Not in the streets as such, but historically, from its most famous sons, Wolfgang Amadeus Mozart, Hadyn, Schubert etc, all the way through to The Sound of Music movie of the sixties. On our second night at Salzburg we attended a performance of Mozart’s ‘The Magic Flute’. To sit in the theatre with its intricately painted ceiling and sculptured cherubs was indeed an enjoyable experience. Finally, we headed further west, to Innsbruck. This is too is a fascinating place – a large city located between alpine ranges, all whitened anew from the recent snow falls. 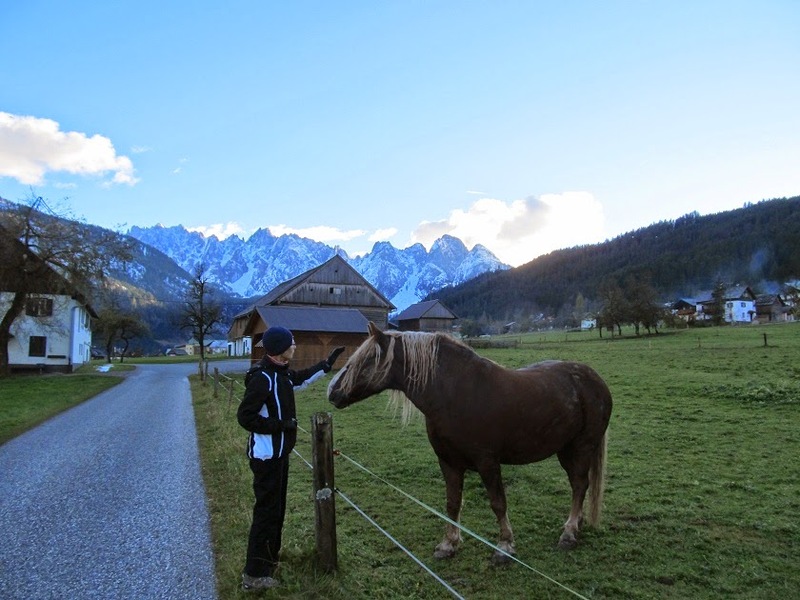 We stayed at a ‘holiday paradise’ (Ferienparadies) a few km from Innsbruck where we were snug in a barrel – a creatively-designed cabin – beautifully warm and experiential! We awoke early on our last morning and went for a walk at daybreak, Its amazing to think that this year we have seen the sun come up over both the desert and over ice covered mountains! 'Morning has broken, like the first morning.